Gir is a place that deserves time and involvement. Your chances of spotting wildlife in a few hours is small, especially in the middle of the day; to truly experience the wonders of the Gir forest, and hopefully see a wide variety of its diverse wildlife, three or four days is recommended, particularly with a knowledgeable guide. This will vastly improve the depth of your visit. Contact the Park for information about hiring a guide (phone number below.) 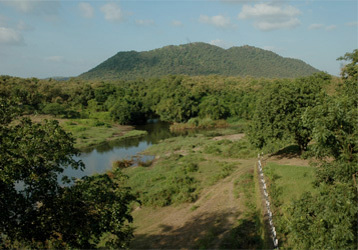 For shorter visits, the Gir Interpretation Zone, at Devalia, 12 km west of Sasan Gir, has some lions in captivity, but this is not the same as visiting them in the wild. After all, to see a lion in captivity you can visit a local zoo; come to Gir to see them in the wild. Entry fees for the Interpretation Centre (different from the park itself) are, for Indians Rs. 75/- Mon.-Fri, Rs.95/- Sat.-Sun, Rs. 115/- on Holidays and for foreigners US$20, payable only in rupees. Use official guides. · No walking or hiking allowed in the park, for safety; always travel in vehicles, preferably with a guide.